This review was originally posted on this blog on 20 December 2010 and has had some minor editing changes. 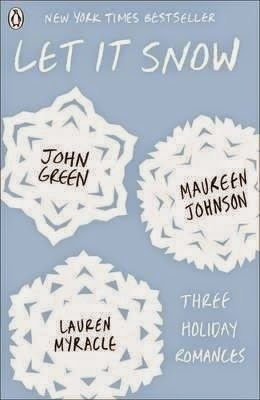 I bought Let It Snow by John Green, Maureen Johnson, and Lauren Myracle during the summer and saved it to be read before Christmas. With three such awesome YA authors, I figured I really couldn't go wrong. Let It Snow is a collection of three intertwined, Christmas-inspired short stories, each written by one of the authors. The stories are as different as the authors themselves as each put their own little quirks into the story and their characters. It's Christmas eve, and a blizzard has stopped a train from passing. There, in Gracetown at a waffle house, three couples find love. New love, love staring you right in the face and love thought loss. I thought each story was quite cute and gently romantic, but also like each story needed a little more time and words for me to fully connect emotionally. Let It Snow opens with Maureen Johnson's contribution, The Jubilee Express. The main character of this short story, Jubilee, has found her Christmas eve plans change dramatically after the news that her parents have been jailed during an annual shopping trip to buy the latest collector's piece in a Santa village. Jubilee's parents are so crazy about this limited edition village that they've named their only child after one of the pieces. With them in jail, instead of the festive evening planned with her perfect boyfriend, Jubilee is on a train to Florida. When a blizzard prevents her train from going any further, Jubilee treks over to a Waffle House where she meets Stuart who invites her to his house for the holidays. I liked Maureen Johnson's story, The Jubilee Express, very much, but I think she had the hardest job. She's trying to set the scene for the other two stories and introducing the different characters that we'll meet later on as well as telling Jubilee's story. Some of the details included during this setting-the-scene stages felt a little strange and out of place but it all makes sense in the end. I think if I was a teenager reading this story, I wouldn't have had as many hang-ups with it. I was questioning Jubilee's decisions the entire way. She's obviously making choices that a typical teenager would make, leaving the train and crossing a freeway, leaving the waffle house with a complete stranger, telling said stranger intimate things about her relationship and so on, that I probably cannot relate to anymore. It was a fun story and Maureen Johnson has such a great eye for detail and humour. Then, John Green's story, The Cheertastic Christmas Miracle, sees Tobin and his friends The Duke (also known as Angie) and JP heading on their way TO the waffle house in order to spend the evening with a bunch of cheerleaders to play Twister. This story seemed a lot more fun and had an element of a road-trip with the different disasters and setbacks that occurred. I really loved the relationship between Tobin and The Duke. And The Duke is quite a fun character, as she's trying really hard to make clear to Tobin that she is actually female and worthy of attention. JP provides some great side-kick material and the requisite humour that one would expect from a John Green story. As I said, the only real problem I have is that I would have liked a little bit more from each story. Lauren Myracle brings up the rear with her story, The Patron Saint of Pigs, involving a Starbucks employee dealing with a breakup with her boyfriend. Addie did a terrible thing and now she no longer has a boyfriend. Instead, she's dealing with the fact that she may well be self-absorbed and it takes a lesson from one of her customers and an adorable little teacup pig to lead her back to love. Lauren Myracle is the author that I have the least experience with, so I wasn't quite sure what to expect with this story. But it was quite cute, if a little slow to get to the love and romance bits. How much do I want a teacup pig now?! Also? A venti gingerbread latte. All in all, I found Let It Snow to be a really light, fun and Christmassy book to read. I'm glad that I waited until December to read it and I'm hoping for snow this year.